Dr. Dana Canuso launches a revolutionary product to treat embarrassing foot problems. Our feet are two of the hardest-working parts of our bodies. They carry us through our intense workouts, long workdays and countless errands, sometimes taking a beating in the process. When their appearance is less than perfect—whether it’s dry, cracked heels or discolored toenails we’d rather hide them than show them off in summer’s cutest sandals. Dr. Dana Canuso says complaints like these are a daily occurrence at her podiatry practice. 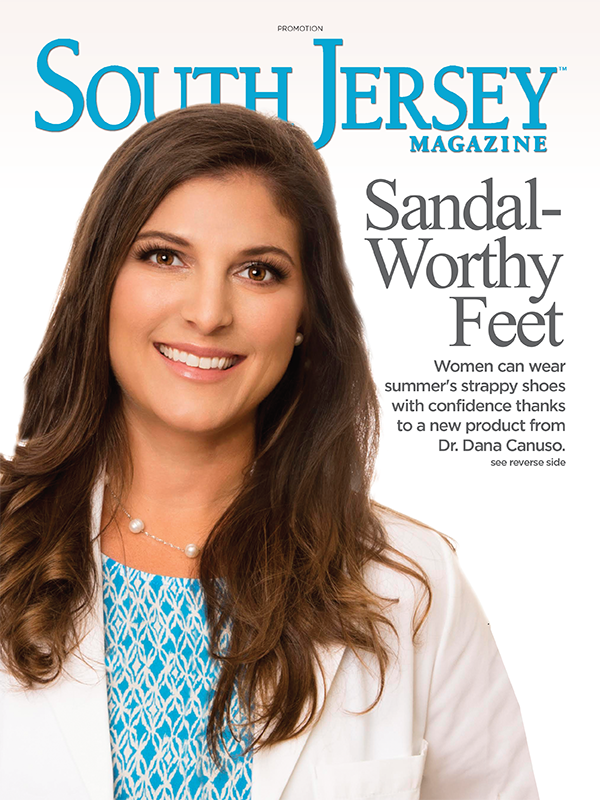 Recognized as a Top Doc by South Jersey Magazine in 2013 and 2015, she has been a podiatrist for six years, diagnosing everything from melanoma and diabetes to pulmonary issues just from examining a person’s feet. But the most common treatment her patients seek is a better appearance for their feet. As a podiatrist, there was little more Dr. Canuso could recommend to patients beyond a thick heel cream available over the counter, or a steroid cream, but the results were not enough for patients. Seeing this common problem over and over again piqued her interest and led Dr. Canuso to reconsider the methods in which people treat the dry skin on their feet. “I started testing the theory that these problems were actually a fungus on the foot,” she says, adding that her patients were not too happy to hear that word associated with their feet. Dr. Canuso says once patients get over the initial shock of what it is, she educates them on why it’s important to treat it. “You cannot ignore fungus. What starts on the heels can turn into a secondary infection, like fungal toenails,” she says. When Dr. Canuso started to treat her patients with anti-fungal medications, their symptoms improved. Seeing these results inspired her to create a product that would be effective as well as luxurious for people to use. A chemistry major in college, Dr. Canuso worked with another experienced chemist who had also worked on other well-known skin care products and ultimately they created the first patent pending, FDA-approved antifungal foot serum. Dr. Canuso recommends using the foot serum twice a day for 21 days, but she says results can be seen after just two days. “I recommend using twice a day, and once feet are healed, you can use once a day or even once a week for maintenance because fungus can come back,” she says, adding that one bottle of serum lasts four to six weeks. Currently, her products are available at DrCanuso.com and will be available at local, high-end salons. Dr. Canuso’s products are the first skin care line created exclusively for the feet and by the end of the year she plans to have a full line of nine products. 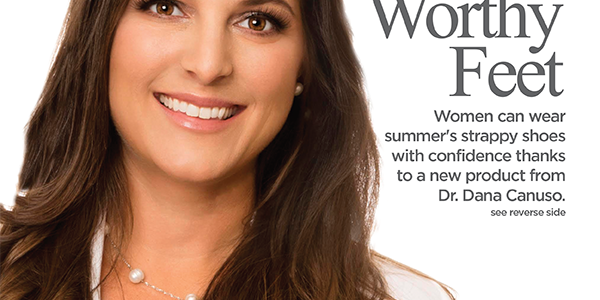 Dr. Canuso hopes to give renewed confidence to women everywhere through these products. For more information about Dr. Dana Canuso and her foot care products, follow her on Facebook for news and updates. After years of fighting with horrible-looking feet I pretty much gave up. But then a family member suggested Dr. Canuso’s Foot Serum, I figured I would try it. Having tried other creams, lotions, pedicures, “tools”, etc., I didn’t expect much. I can honestly say that it has been one of the best things to happen to me. I can’t wait [to] buy some new open-toe shoes!